Since Maurice Yacowar’s Hitchcock’s British Films (Shoe String Press, 1977) and the recent emergence of critical work re-evaluating the once supposedly barren terrain of British cinema, a new study of Hitchcock’s generally neglected pre-Hollywood films is long overdue. This area has already begun to receive critical recognition. Robin Wood recently changed his attitude to Hitchcock’s British period and has examined select films such as Blackmail (1929), The 39 Steps (1935), and Young And Innocent (1937). Other writers such as Tania Modleski, Ken Mogg, William Rothman, and David Sterritt have also noted the formative influence of Hitchcock’s early films upon later acclaimed works. Following his ’80s pioneering essays on the silent and sound versions of Blackmail and other films, Charles Barr now provides a stimulating study of the entire British period in English Hitchcock, which should inspire further exploration. Barr does not wish to argue for the superiority of Hitchcock’s British films over his Hollywood work. Neither does he refrain from making necessary evaluative judgements. He does intend to see, however, the British films as key components in the creative formation of a talented director whose later work was more indebted to earlier influences than previous studies have shown. Apart from The Mountain Eagle (1926) which presently exists in a few stills, all of Hitchcock’s films are now available for study whether confined to archives or generally accessible on DVD, video, 16mm or other formats. Rather than tread problematic “auteur” terrains, Barr’s study owes much to the complex nature of the “authorship” concept defined 20 years ago by John Caughie in his Theories of Authorship: A Reader (Routledge Kegan & Paul, 1981) anthology. Although post-structuralists generally remain frozen within Foucault’s debateable and over-influential “death of the author” thesis, we must remember that Caughie’s final section found a place for the author as existing within relevant economic, cultural, industrial and collaborative influences, all equally constraining as well as challenging. This particular “structure of feeling” influences Barr’s study. Rather than using Maurice Yacowar’s “British Hitchcock” definition, Barr prefers the more appropriately nationalistic “English” term. The director was born and raised in London rather than influenced by the colonialized Celtic strains within the arbitrarily enforced definition of the United Kingdom. He was a Londoner at heart. But, unlike Karl May who never ventured west of the Rhine, Hitchcock was also European and cosmopolitan, travelling frequently whenever possible. Although Barr is sensibly alert to the nuances of “English” versus “British”, we should also remember that Celtic influences such as John Buchan and actors such as John Laurie, Sara Allgood and others in his repertory company – to say nothing of Carl Brisson and Andy Ondra – were also present. In Hitchcock’s use of key players such as Donald Calthrop, Malcolm Keen, John Longden, John Stuart and others, he was above all an “Englishman” but not in the sense of Gilbert and Sullivan’s well-known refrain. As well as enjoying the talents of Donald Calthrop (most notably in Elstree Calling ), Hitchcock was also aware of the dark side of the English persona as his use of John Longden often revealed. Above all, Hitchcock was a cosmopolitan Englishman, influenced both by key elements within his national culture as well as formative cinematic influences from elsewhere: German expressionism, Hollywood cinema, and Soviet montage. Barr’s study significantly directs the reader to discern key components of this confluence of cultures as well as revealing exactly how they were important in the development of the future Hollywood Hitchcock. …powerful family melodramas involving the same kinds of personal emotion and tension that have produced the dynamic of the earlier films and their classic strategy of interweaving the public and the private is something that Hitchcock’s later work would rapidly adopt and refine in the English thrillers of the later 1930s, and then in early Hollywood films such as Foreign Correspondent and Notorious. John Buchan and Marie Bellow Lowndes are fascinatingly complementary figures: Protestant and Catholic, Anglo-Scottish and Anglo-French, male and female. Buchan, the novelist of action and adventure, always with a male protagonist; Belloc Lowndes, the novelist of interior drama, known in the words of Virginia Macdonald for her ‘sensitive understanding of women’s problems, a modern sensibility, a concern with the psychology of crime’. Barr also sees Buchan’s influence as a crucial factor in the development of the Hitchcock thriller, especially in The Man Who Knew Too Much (1934), which contains more specifics relating to the author’s style than The 39 Steps. Barr comments that Buchan’s preface to The 39 Steps involving the aim of writing applies more to The Man Who Knew Too Much than the succeeding film. Concerned to rescue the silent films and the early influence of Eliot Stannard from oblivion, Barr sees the 1930s thrillers as a “narrowing down and in some ways even an impoverishment” of rich thematic features within earlier films such as The Manxman (1929), The Farmer’s Wife (1928) in addition to the already acknowledged The Lodger (1927). He also draws attention to multiple versions of The Pleasure Garden (1925) as well as the possibility of different texts circulating in both the silent and sound eras. Several texts have been lost, such as the films for which Hitchcock wrote intertitles in the mid-’20s as well as his uncompleted first project Number 13 (1922) and his co-directed (with Graham Cutts) Woman To Woman. But other excavated pleasures that Barr considers include now forgotten figures such as Clemence Dane and Helen Simpson in the construction of Murder! (1930) as well as the relevance of Dale Collins’s original novel Rich and Strange in relation to the film of the same name. Collins’s novel is usually ignored in most studies of the film while Clemence Dane and Helen Simpson’s co-authored theatrical novel Enter Sir John already contained a certain “quality of playfulness” which Hitchcock elaborated and probably dropped to appease the sensibilities of Alfred Abel in the German language version Mary (1930). In addition to familiar names such as Joseph Conrad and Somerset Maugham, John Galsworthy and J.B. Priestly also appear as relevant influences concerning Hitchcock’s evolving sense of story structure. Hitchcock used two actors from the original 1920 stage production of Galsworthy’s The Skin Game in his 1931 version – as well as using others too old to replay their original stage roles in his other sound films. This shows his interest in stage as well as screen acting, elements usually thought to be opposites in accounts of British cinema. Edmund Gwenn and Helen Haye both reprised their 1920 original roles in the film version, while Helen Haye also appeared as the icy Mrs. Jordan in The 39 Steps. These features really need pursuing in further detail. 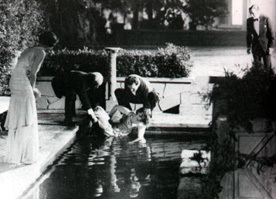 Barr also notes that the appearance of Jill and Rolf at the beginning and end of The Skin Game (1931) gives the film a different structural prominence absent from the stage version by suggesting a final shot of the couple tentatively opposing the old order, foreshadowing the final shot of The 39 Steps. Theatre, as well as novels, thus played a major role in Hitchcock’s development. Barr argues for the re-evaluation of other “odd” Hitchcock films such as Number Seventeen (1932) and Waltzes From Vienna (1933) (sadly only available outside archives in dubbed French versions including Jessie Matthews’ songs!). He often creates quite stimulating arguments at the expense of other films such as Downhill (1927) and The Ring (1927). These works also deal with key issues of gender instability and masculine crises present in the other films Barr chooses to champion. Fully aware of the importance of precisely defined edited sequences within certain films, Barr provides several examples of sequential analysis within The Pleasure Garden, The Lodger, The Farmer’s Wife, Blackmail, The Skin Game, and Young And Innocent very much in the spirit of early Christian Metz. Barr concludes his book with a reference to his 1986 introduction to English Hitchcock in the edited collection All Our Yesterdays: 90 Years of British Cinema (BFI, 1987). “How far his career can actually be counted to the credit of his native country and cinema, rather than, by an unkind logic, to their Discredit, is still a matter of critical debate.” The debate is now over in this area. 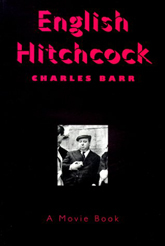 Barr has revealed the particular ways Hitchcock was indebted to both his national culture and his collaborators. English Hitchcock is a fascinating book. Although one may disagree with several of his judgements, especially concerning Number Seventeen in relation to The Ring, Barr has definitely opened up this traditionally unfamiliar territory (with the exception, of course, of the dedicated work appearing in The MacGuffin) to further exploration. It is a key text in the area indispensable for future reference.